Furrows in the Desert (FID) is an agricultural development project introducing sustainable agriculture in the Turkana region in northern Kenya, to contribute towards food security and the generation of income for the local population. FID is a community-participatory joint program of the Arava Center for Sustainable Development, the Missionary Community of Saint Paul the Apostle, and Brit Olam, and local semi-nomadic communities of north Turkana. Arava Institute alumna Noa Gluskinos joined the project at the beginning of February to volunteer for six months and will be sending us monthly impressions of her experience at the farm. After a month and a half at Lobur, Turkana, Kenya, and meeting the same people every day – and there are not a lot of people here –, I feel as if I have been living in this village and working on this farm for years. Connections are made quickly, and you soon know everyone, who their kids are, what they do, what makes them laugh, and who they don’t like. This month we started teaching theoretical lessons and the trainees surprised us with their attention and listening. Because most of them never went to school and don’t know how to read and write we need to find creative ways to teach them the theoretical material. 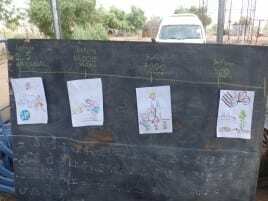 Tiki instructed the trainees to draw plants the way they see them in Plant Anatomy lessons, and Roy hung drawings that tell the story of the development of agriculture in his History of Agriculture class. Ayelet taught them how to cook the vegetables they grow, and prepared with them pumpkin jam and stuffed bean leaves. And I taught them to prepare natural deodorant from Java grass roots, a weed which is bad for crops but its roots are good for human use. Joseph Akutan is the course translator, and also serves as the coordinator for the trainees. He lives on the farm and is the first address for the trainees when problems arise. Joseph has a natural sense for education. He suggested that after every lesson the trainees give the same lesson themselves the day after to test what they remember and practice the theoretical material. This idea turned out to be very successful; the trainees were very enthusiastic about their status as teachers, and explained what they had learned in class. share. We are introducing them to Israeli songs and expressions, and they in turn teach us some of the Turkana language and culture. I personally learned something interesting this month about a local species of gourd fruit, which is grown on our farm and many of the graduates’ farms. When the gourd is ripe, it is dried in the shade or under a cover of weeds. When it is dry, it is emptied and used as a container for milk. 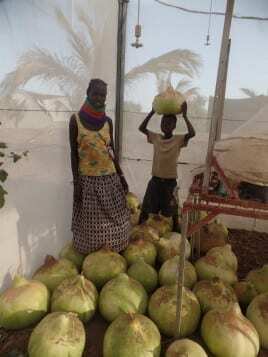 It is considered sacred in the local Turkana culture, and therefore sold at the price of a young female goat, which is very high! We now have a lot of gourds that are ready for sale which will provide nice revenue for the farm.